Explain the benefits of using permanent fabric structures in a variety of outdoor situations to improve the health and safety of the public. Discuss the basics of fabrics and membranes as well as their associated components related to the successful design and engineering of fabric structures. Compare materials in terms of efficacy in different regions and climates to maximize cost-effective and durable solutions that promote the physical and social well-being of users. Describe trends in fabric structures in terms of green building goals. They can be visually striking, dramatic and distinctive, even seeming to defy gravity with fluid, organic exteriors and light clear-span interiors. They are sustainable solutions with reduced materials and environmental performance, all with the durability of a permanent building or facility. These compelling building types are fabric structures, and while they have been around since the time of primitive man who fashioned simple shelters of animal skins that hung between sticks, today’s versions offer a wide range of sophisticated opportunities for designers interested in doing more with less, while enhancing aesthetic appeal and providing a high-quality user experience. This article will serve as a primer on fabric structures as a sustainable architectural solution, explaining the overall benefits, the various forms and fabrics, and the step-by-step design through implementation process. Also presented will be trends in the industry, as well as profiles of fabric structures in various applications. Fabric architecture involves three components: a structural system, a tensioning and/or compression system, and a membrane. A fabric structure is generally characterized by tensioning of a material with wire, cable and/or other hardware incorporated with some type of structural support. Typically, framing and fabric work together under tension and compression, often achieving a strong yet airy look. Fabrics range from coated and laminated products to woven and knitted architectural materials, sometimes with synthetics added to increase durability, strength and ability to stand up to environmental forces. Many fabrics also meet flame retardant and fire code standards. Fabric structures can be temporary or permanent, and they can take on nearly any shape and size. Applications range from a lightweight roof or protective cover for sun or weather protection to canopies, awnings and larger shade structures, all the way up to high-profile, massive projects such as domed stadiums, millennium domes, arenas, band shells, shopping malls and airports. 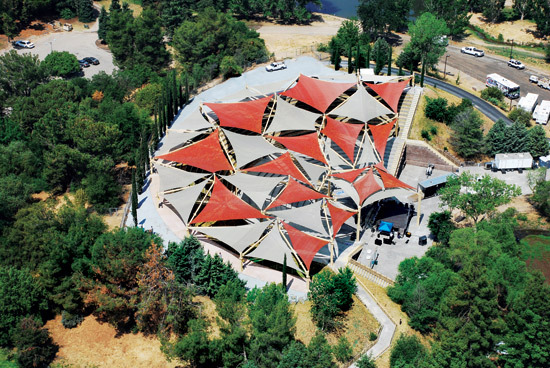 The focus of this article will be on permanent, engineered fabric structures. Photo courtesy of Shade Structures, Inc. Fabric architecture is a striking and sustainable solution for a host of applications.